Experience legendary Alaska fishing with a light tackle fishing trip featuring large Sockeye Salmon and Trout on Haines' magnificent Chilkoot Lake. Chilkoot Lake's name translates to "Basket of Bigger Fish" in the native tongue, and holds Southeast Alaska's largest Sockeye Salmon. Chilkoot is a beautiful blue-green glacier fed lake, nestled in 6,000 foot high mountains and surrounded by alpine meadows, glaciers and virgin forests. Prepare for exhilaration as the powerful, fighting Sockeye and Dolly Varden are teased onto your line. Let our experienced captain/guide assist you with technique, lure selection or simply photographing your beautiful trophy catch. We suggest cameras to capture colorful local fishermen: Brown Bears, River Otters, Bald Eagles, Merganser Ducks and Kingfishers. Alive with wildlife, Chilkoot Lake's breathtaking scenery of mountains and forested slopes include sightings of Mountain Goats on the steep slopes surrounding the lake, and many other treasured Alaskan animals and birds native to the area. We can comfortably accommodate six fishermen per boat, so bring your friends for a great time. 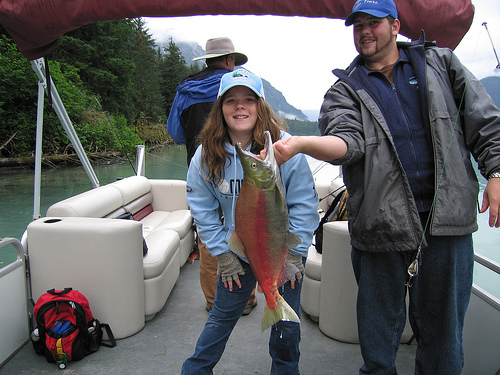 Sockeye Salmon fishing starts in mid-June, Pink Salmon in July and Dollies all season. The ones you catch make the best pictures. The ones that get away make the best stories. The time you spend makes the best memories.